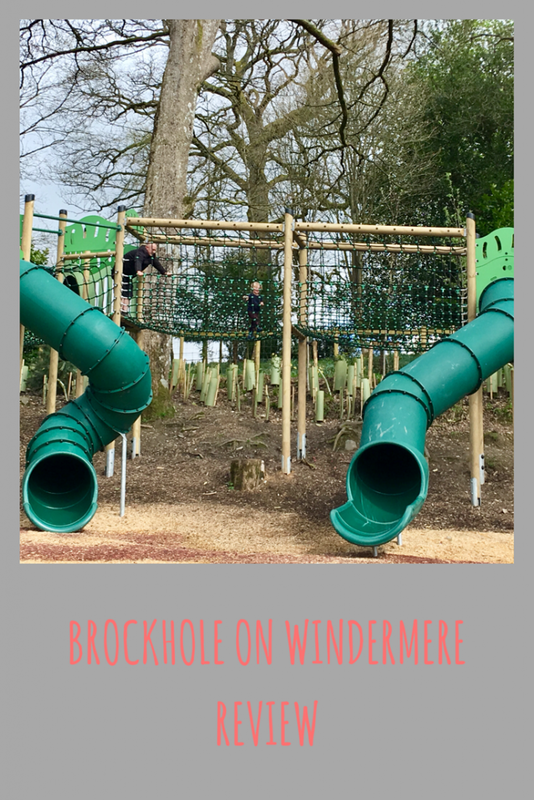 On our recent visit to Windermere we spent a day at Brockhole on Windermere. 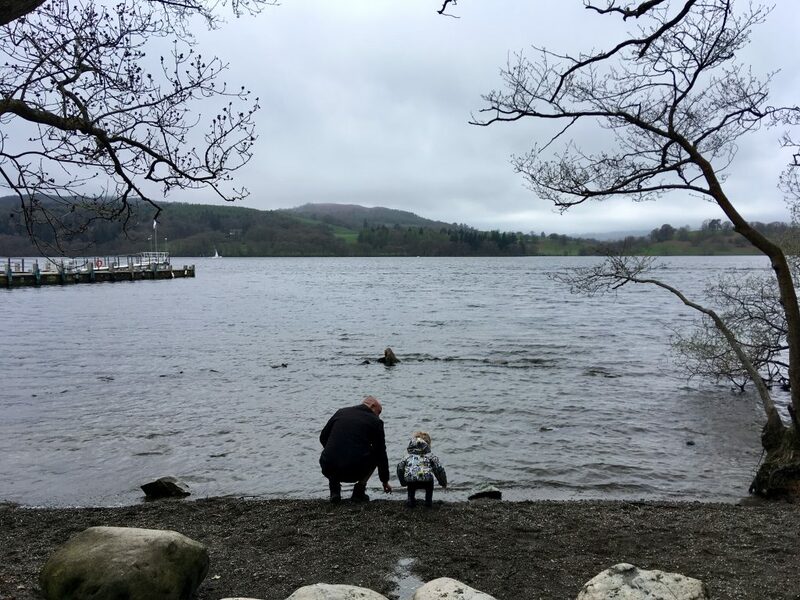 We tend to go every time we visit the Lakes as there is so much to do there. We set out from Lakeside Pier in Windermere on a lovely boat journey across to Brockholes. There are numerous crossings from Lakeside to the different parts of the lake making them so accessible to everyone. Once we got off the boat we headed to the lakeside where D and Lucas promptly had their wellies off and were paddling and throwing skimmers across the lake. Perhaps not the best thing to do getting wet feet with no towel on us before we go exploring boys! When we arrived, we had a walk around the stunning gardens. The grounds cover an area of 30 acres with 10 acres of formal gardens. 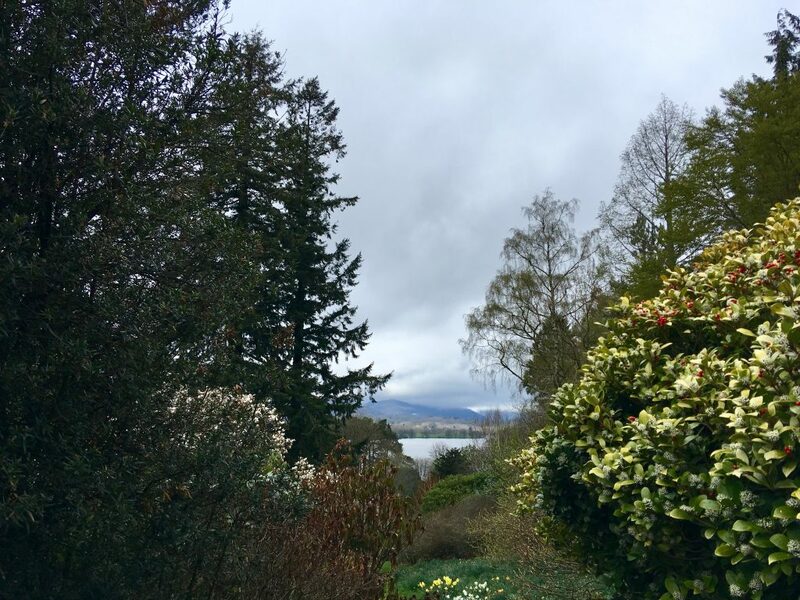 The garden was built as a series of South and West facing terraces, sloping gently down to the shores of Lake Windermere, moving from formal to informal planting through flowerbeds, meadow and woodland to the lakeshore. The terraces enjoy a beautiful view of the Langdale Pikes, Pike of Stickle and Harrison Stickle, two of the most well-known Lake District mountains. You could literally spend a full walking round the gardens, we spent an hour taking in the many vibrant and flourishing plants and flowers which were blossoming on this beautiful spring day. 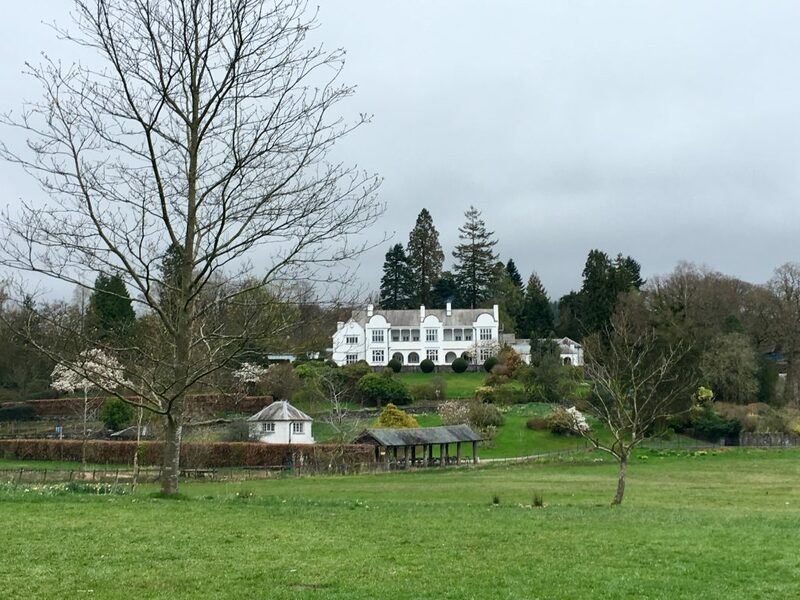 William Gaddum originally purchased the site and had Brockhole built in 1899 and lived here with his wife Edith Potter (cousin of Beatrix Potter). The Lake District National Park Authority bought the site in 1966 and turned into a visitor centre in 1969 attracting 40,000 visitors in its first month! We love a game of crazy golf and Brockholes have a lovely little course, this time Lucas could play as last time he was still baby. 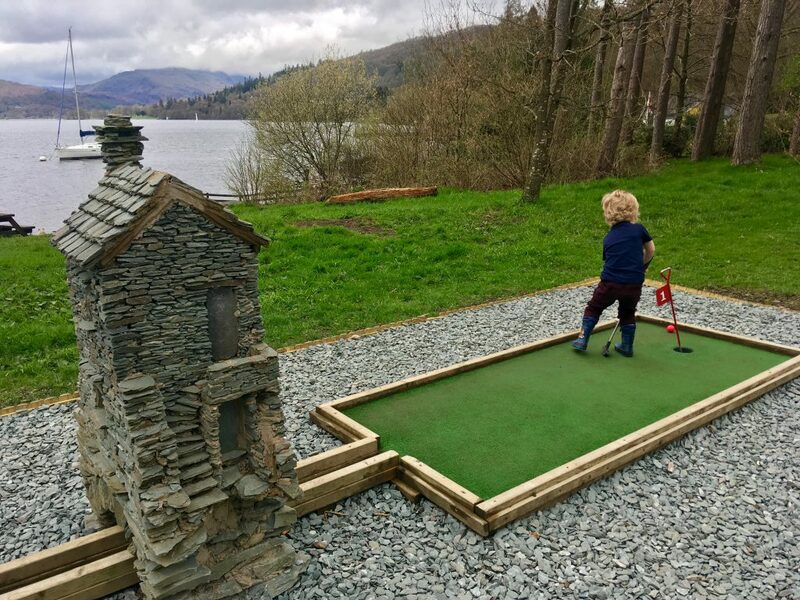 The 9-hole course is themed on the Lake District and Cumbria with its obstacles with sheep, cows, Beatrix Potter rabbit and wellies to name a few. I managed to get a hole in one which I was delighted with as its normally D who pulls that off! Whilst we were playing mini golf which is situated next to the lake, people were enjoying canoeing and hiring boats which are hired off the island. By now we were feeling rather hungry so headed up to the Brockhole Café which is dog friendly overlooking the lake, we had a delicious lunch and felt ready to explore some more. There is also another café in the grounds near the adventure area called The Garden Shed and also the Gaddum Restaurant which provides lunches and afternoon teas. On our way back out we came across the Brockhole Gift Shop which is a treasure trove of all things Cumbrian. Local jams, beers and mint cake are just a few of the delicious produce you could buy as holiday presents or for yourself. Within the house they also display exhibitions of Marion Kuit who bases her prints on her time travelling around Ireland, Shetland, Cornwall and Scandinavia. Based in the gift shop there are rooms with interactive screens on the different industry synonymous which Cumbria. We made our way down to the adventure area which Lucas was keen to try the moment we arrived. Here there is something for anybody, from an amazing equipped wooden play area for smaller children and all-weather play area. 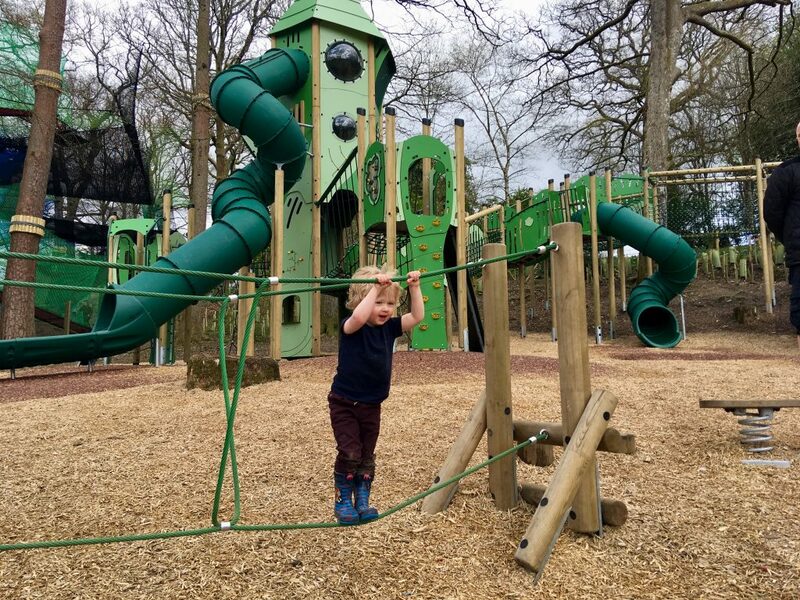 For the larger children there is a vast climbing area or if you are feeling brave the tree tops nets which run across numerous tall trees. At the top of the tree top nets is a zip wire that takes you to the shoreline. Unfortunately, Lucas is a little too small now for these but next year there will be no stopping him in those nets. Whilst we strolled some more a group passed us who had hired a pony tour which looked good fun. Down at the bottom of the gardens there was an archery lesson going on and we also bumped into two orienteering teams and a group of children on a nature trail. There are also laser clay pigeon lessons being taught and bikes available to hire. This looks like a fantastic place. I’ve not been to lake windermere in absolutely years, I really should go back!! What a lovely place to visit. The view in the fist photo looks stunning 🙂 I have never been here before but would love too. What a lovely place to visit and I’m loving the stunning views. Sounds like a lovely day out. I’d love to explore the Lake District one day as we never got the chance before we left the UK. One day though! Oh how lovely! We love windermere but have never heard of this place before! Will have to hunt it out! My kids would love this place. It looks like a fun place to play. Looks like you had an amazing trip, I NEED to go to the Lake District it looks amazing! Wow this place looks beautiful and what a playground! I can see myself visiting her!